Fournier stalled the Heat's rally by scoring seven points in the final 2:27, including a driving basket with 30 seconds left. The Heat trailed by 17 early in the fourth quarter but cut the deficit to two with 2:39 to play. That's when Fournier hit the first of three big shots, a 3-pointer for a 108-103 lead. Hassan Whiteside keyed the Heat's comeback and finished with 26 points and 22 rebounds. Goran Dragic had 17 points and six assists. 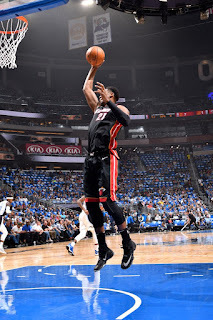 Whiteside sparked the Heat with eight straight points, including a 3-pointer to cut the deficit to nine with 6:08 remaining. Dragic made it 105-103 with two free throws before Fournier's 3. Terrence Ross scored 15 points and Elfrid Payton had 13 points and nine assists. All five Magic starters had at least 10 points. The Magic were stronger on the boards and on the break in the opening half. The Magic outrebounded Miami 26-20 and had 15 second-chance points compared to six by the Heat. Orlando also had seven fast-break points while the Heat didn't convert any during the first 24 minutes. Heat: All five of Miami's starters scored in double figures. Kelly Olynyk had 10 points in his first game with the Heat and Dion Waiters had 15. ... Whiteside had 10 rebounds in the first half. Magic: Rookie Jonathan Isaac, the No. 6 overall pick in June's NBA Draft, converted his first NBA attempt on a put-back late in the first quarter after coming in with 3:10 to play. ... Gordon took a hard hit from Whiteside on a baseline drive late in the second quarter. Gordon remained on the floor momentarily before getting up. The play was reviewed and ruled a common foul. Heat: Host Indiana on Saturday.